Don't Join Company Secretary Course Without Knowing These Details. There are 3 stages in Company Secretary Course. 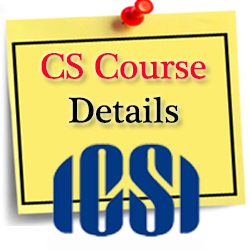 Here we are providing C.S course details because many students are asking questions like how to become a company secretary, What is CS Course? etc. In our previous posts, we wrote about ICWA Course Details and CA Course Details read those posts also. This post provides details about cs course information like admission, registration cs course details after graduation, Course duration, Examination, syllabus, etc. for more information check another post of CS Course Details written by other author in this site. ICSI (The Institute of Company Secretaries of India) which is the CS Institute and the premier National Professional body established by Act of Parliament to develop and regulate the Profession of Company Secretaries. The student has to go 15 months of practical training which may opt after passing the Executive program. The professional program can be pursued after successful completion of the Executive course. After completion of the professional course and 15 months training student is joined as Associate Member of the ICSI and called as Associate company secretary (ACS). The following are the subjects in different stages of cs course. see the company secretary course subjects below. 7 days Student Induction Program (SIP). 70 hours compulsory computer training program. 8 days Executive Development Program (EDP). 25 hours of Professional Development Program (PDP) during 15 months training. 15 months training after passing the Executive Program or Professional Program. 3 months practical training is required to be undergone by the student if the student completes professional program examination and exempted from undergoing at least 12 months training on the basis of Company Secretaries Regulations. 15 days training in a specialized agency. 15 days Management Skills Orientation Program (MSOP). Admission for company secretary course: CS Foundation registration is open for an entire year. If you want to attend company secretary entrance exam in December then you should register in March. If you want to attend company secretary entrance exam in June then register before or in September. See the CS Course fees details for company secretary course registration below. Graduated students can go to Executive program directly without foundation program. Examinations are conducted twice a year. Examination fee for foundation course is Rs 1200 /- and For executive, professional Rs 1200/- per module. Except business communication subject, Institute allows a facility to students to appear in examination in English as well as in Hindi. Qualifying marks for CS course are as follows. The student is declared as passed in the Foundation or Executive or Professional exams if he or she secures at one sitting a minimum of 40% marks in each paper and 50% marks in the aggregate of all subjects. Placement cells at Institute’s Headquarters, its Regional and Chapter offices are helping to the members to get suitable placements. Merit students can get a salary ranging between Rs 3 lacs to Rs 5 lacs per annum. In large companies, salaries may range up to one crore also. But depends on the capabilities of the candidate and sector. Can work as in-house legal experts or compliance officers in the office. Can work as an expert in corporate laws and corporate governance. Can work as a chief advisor to the board of directors. Can work as a corporate planner and more roles. After reading this article you may get some idea about company secretaryship. Please share this information about C S Course Details with your friends also. I am completed degree but I interested in cs programme plz tell me structure of cs and fee details. I am 53 years old and I am commerce graduate can I eligible to attend executive level exams? Can I join C’s course while doing job? Thanks for helping me….but sir I want to know about that how much percentage aggregate for cs foundation. I’m a 12th science pass student..m I eligible for this? Being from a science background, will it be possible for me to study this since it has subjects like auditing? Yes u are able to give cs exams but u have to work hard in comprision of commerce students. Sir I’m graduate bsc maths can I join.. I want to know that How much percentage for cs foundation. I have completed MBA and doing job in finance plat from. I want to grow in my career so i am planning to do CS .Is CS helpful for me to grow. If yes, please suggest how to approach for it. What is the time duration to complete the course? I had completed BBA, can I do CS? kindly guide me and give me a full detail about CS. i am studying in bsc computers, can i do cs? please guide me. i am studying in BSC computers,can i do cs?please guide me. Can uh tell me that I m Pershing graduation so can I also give the entrance exam of CS ?? I am interested 2 study ths course but i cme frm other grp lke bio so plzz say me i can study ths course r not? I had completed B.Com, can I do CS? kindly guide me and please give me a full details about CS. I am graduate from commerce and working in accounts department but i want to do any professional course, is CS is good. Is it possible to with continuing with my job. Pls suggest. I’m doing my bcom 1 year nw……can I enroll myself into this course? I had completed M.COM can I do CS? kindly guide me and give me a full detail about CS. I have completed MCOM in ‘IBB’ and doing job in finance plat from. I want to grow in my career so i am planning to do CS .Is CS helpful for me to grow. If yes, please suggest how to approach for it. What is the time duration to complete the course? what need qualification for icsi course? I am a law student can i appear cs course in hindi..and age limit.. Which classes are better for ICSI course. Am a student of b.com final year, so plzz give me a full details of CS course. I have completed b.com with 53percentage,can I join cs course? Hii respected sir or mam i passed class 12th n m doing bcom 2nd year right now so should i fill the form for C.S..
iam also same .. I have passed 12th. but we are eligible for CS course. Life is noy esy servive so..
can i do CS with regular college..?? I mean regular college ke sath CS krne mae koi dikat tho nii aiigi naa..?? Myself Ashwini, am doing job can i do this job with working as i did my post graduation as M.com and am living in chitradurga. Can u help me as adviser? Sir or mam, I have completed becom on 50% marks on 2014 .can I join cs course. cs fees and duration. kindly guide me and give me a full detail about CS. foundation.excutive.proffessional courses total 2 year courses….? i had complete my inter c.e.c on 2012 on 65 percentage….. I can eligibility for CS course giveme a suggestion please…. i complete m.com so kindly give me info . how to enrolle CS courses. Sir i’m B.Com Taxation Student & I was interested in CS I can eligibility for cs ? sir plz tell fees details &structure . Hi Sir / ma’am, I have completed BMS.so I am intereste in CScotland so plz can u give mi info.such year fees duration. I am a PG. Should I write CS foundation or directly write executive exam? who one can get exemption from practical training for CS course. I have completed my B.Com graduation with 65% marks in IGNOU. I can write CS Executive Programme Exam in this coming December 2017. Sir, My age is 41. I have completed my diploma in secretarial practice in 1995 in 2nd class nd I have completed my B com with KSOU in distance education passed in I CLASS. Now I am working in private company. Can join CS. From which course I have to start, whether executive or what. And duration of the course. Plz guide me . Sir what is the work of cs in company and salary of the cs?? Now I am studying in 12th.First I was confused about my higher studies but after reading the CS syllabus and modules and durations of the course I would like to prefer this course. may I know that when is the best time to approach to this field. before graduation or after? I am pursing degree but I interested in cs programme plz tell me structure of cs and fee details. Myself Rameh Rampathoti, am doing job can i do this job with working as i did my post graduation as MBA and am living in Bangalore. Can u help me as adviser? Hi, I want to know CS course is possible with job ?? kya c.s ke exam ke liye english aana jaruri hai? For foundation course, is there any kind coaching ?? Informative read on the why & what of Company Secretary course.. I am a bcom holder and I wish to become cs. Is it possible that I write executive program without attend any class? And what about the 7 day sip? Arts Course Details – Degrees List, Eligibility, Fees, Admission, etc.